Whether you’re thinking of moving to upstate New York, or if New York City has you dreaming of your next adventure, the Empire State has a lot to offer. However, living in New York isn’t all about great restaurants and Broadway plays. If you truly want to become a resident of the state, there are many pros and cons the experts at MovingAddresses.org want you to know about. 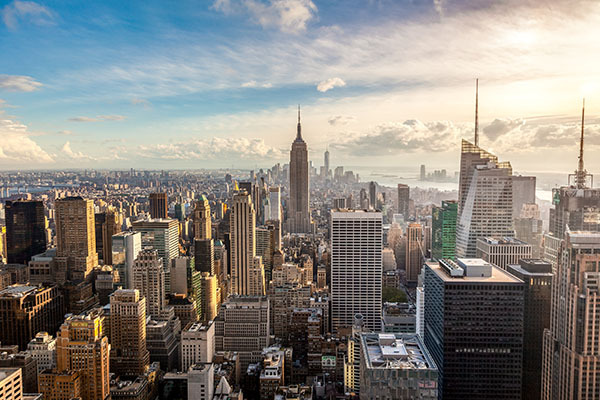 Here are a few of these pros and cons you should review before making a move to the Big Apple. Pro: There are endless museums and cultural experiences – New York is known for its diversity and culture, so your free time can be filled with the exploration of art and history museums. With countless cultural and art exhibits, the city can be a great place to call home if you enjoy being a tourist in your own neighborhood. The experts at MovingAddresses.org remind potential residents that New York offers one-of-a-kind museums, like the Metropolitan Museum of Art, the Whitney Museum of American Art and the American Museum of Natural History. Con: Wintertime brings snow and frigid temperatures – The winter months in New York can be brutal. If you’re not used to the cold of the north, this time of year can make you not want to go outdoors for months. Sloshy snow and ice can sometimes cover the city during the wintertime, making for an inconvenient, uncomfortable and messy commute. Since New York is primarily a walking city, you may find yourself forced to be active in these cold temperatures more than you normally would living in any other community. Pro: There are countless job opportunities – With a large population and being the home to many company headquarters, New York is a great place for job opportunities. The team of experts at MovingAddresses.org suggest New York City as a place to explore if you’re interested in a job in advertising, art or finance. The city offers many places of business in which to inquire about internships, part-time jobs, and career opportunities. It can be a helpful place to live if you’re looking to jumpstart your professional life and gain corporate experience. Con: The cost of living can be astronomical – Depending on where in the state you’re hoping to live, you may find the rent or purchase price of real estate to be high. Even the smallest apartments in the city can be priced expensively because of the desirable location. You may find your new home to be less than desirable in size and amenities. There are also high taxes to pay in the city, so it’s important to calculate all of these living expenses before making a move. Pro: There are lots of public transportation options – The subway system, extensive bus routes and taxis make getting around the city easy. Many New Yorkers don’t own a car, and therefore, don’t have to deal with the expenses of car insurance, parking, maintenance or gas. As a pedestrian-friendly city, you may find it easier to walk to your destinations and workplace. The team of experts at MovingAddresses.org suggest learning the subway and bus routes so you can get around quickly and easily if bad weather strikes and walking is not an option. If you’re a frequent out-of-town traveler, New York also offers multiple airports close by to the city, making it easy to fly out whenever you need. Con: The city can be loud and crowded – If you dream of moving into the heart of the city, be prepared for the constant noise of traffic and people. The city can be a loud place to live, so if you’re a light sleeper or someone who needs peace and quiet to feel comfortable, you may want to rethink your decision. The experts at MovingAddresses.org suggest giving yourself plenty of time to find a place to live in the city so you can scope out the quieter areas before signing a lease. You may have to compromise on location and vicinity to the hustle and bustle of the city if the crowds and loud city chatter are less than desirable for your lifestyle.